Elder abuse is a significant problem nationwide, and although demographically, seniors are a larger population than teens, there are disproportionately fewer resources to address their needs for safety and autonomy. Their vulnerability and dependence, their health and/or cognitive capacity problems, ageism, and sexism, are the very factors that compound victimization and confound intervention. Does the victimization of older women stem from vulnerabilities associated with aging, i.e., elder abuse; or patriarchal power dynamics, i.e., intimate partner violence (IPV); or both? This question arises because definitions of elder abuse do not explicitly include IPV in later life; and the elder abuse field lacks a robust gender analysis. Conversely, the violence against women field does not adequately examine impacts of generational and aging factors on how older women experience IPV. Learn more about how incorporating a gender analysis in the elder abuse field can enhance access for older survivors. 86% of Asian Americans over 65 are foreign-born, significantly more than any other racial group. 27% of Native Hawaiians or Pacific Islanders over 65 are foreign-born. 60% of Asians and Pacific Islanders over 65 have limited English proficiency. A comprehensive review article estimated the prevalence of elder abuse to be approximately 10%, including physical, psychological, verbal, and sexual abuse, financial exploitation, and neglect. Lachs MS & Pillemer KA. 2015. Elder Abuse. New England Journal of Medicine. 373:1947-1956. Additional information and statistics on demographics, prevalence of abuse, perpetrators, and types of elder abuse is available from the National Council on Elder Abuse (NCEA) webpage on statistics and data. 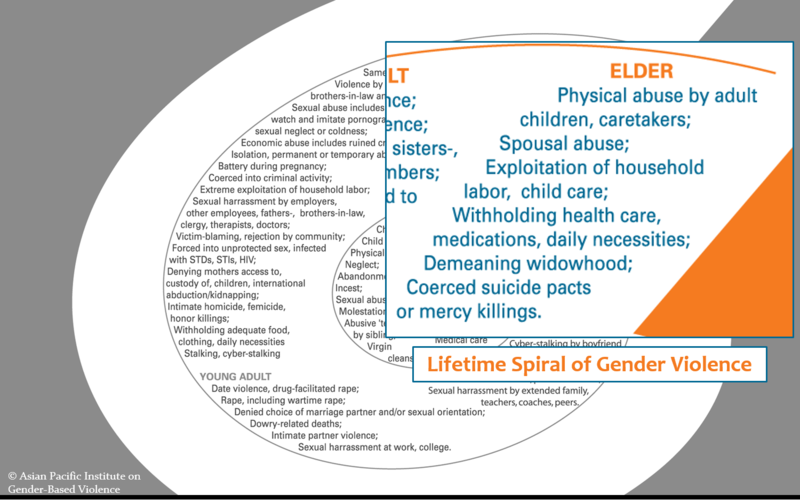 Elders occupy the furthest segment of the Lifetime Spiral of Gender Violence. Pacific Islanders and Asian immigrants and refugees face unique dynamics, trends and traumas – often accompanied by negative help-seeking experiences over the lifespan. In many API communities, because family is afforded a higher value than the individual and because patriarchal norms devalue women, there can be increased risk for API elders – cultural expectations can silence disclosure and inhibit help seeking because it is considered disruptive and shameful to family and community unity. Elder abuse in Asian and Pacific Islander communities may be overlooked by service providers, who assume that respect for and deference to elders is culturally normative, and may not screen for it. Culturally-specific types of elder abuse can include demeaning widows, hyper-exploitation of household labor by adult children, extreme isolation due to limited English proficiency and/or immigration status, rejection of now-elderly women who were raped in conflict zones or refugee camps, and severely ostracizing elderly gay/lesbian couples. For those elderly Asians and Pacific Islanders with limited English proficiency – be they U.S.-born, immigrant or refugee survivors – trained interpreters must be provided. Deaf Asians and Pacific Islanders do not necessarily know American Sign Language. Survivors who sustained hearing loss in old age; or became hard of hearing, deaf, or deaf-blind due to physical and psychological injuries in war zones, disaster zones, refugee camps, or due to lack of medical care in those conditions, will need relay or intermediary interpretation. Additional tipsheets on language access are available here. These training slides enumerate several types of abuses faced by API elders while offering recommendations for advocates. National Asian Pacific Center on Aging: works to preserve and promote the dignity, well-being, and quality of life of Asian Americans and Pacific Islanders as they age. National Center on Elder Abuse: provides the latest information regarding research, training, best practices, news and resources on elder abuse, neglect and exploitation to professionals and the public. Maintains a directory of state resources on elder abuse and a collection of publications on elder abuse prevention and intervention. National Clearinghouse on Abuse in Later Life: provides advocacy and education to challenge and change the beliefs, policies, practices, and systems that allow elder abuse to occur and continue. Offers a collection of publications and resources to help others better understand and respond to abuse in later life. Abuse in Later Life Directory can be used to browse for elder abuse services by location, program type, and services provided. Chang M. 2016. Experience of Elder Abuse among Older Korean Immigrants. Journal of Elder Abuse & Neglect. 28(2): 76-94. Lee Y, Kaplan CP, & Perez-Stable EJ. 2014. Elder Mistreatment among Chinese and Korean Immigrants: The Roles of Sociocultural Contexts on Perceptions and Help-Seeking Behaviors. Journal of Elder Abuse & Neglect. 26(3): 244-269.